Based on the research done by ReclaiMe Company, Buffalo devices are most often found in data recovery cases. VOLGOGRAD, RUSSIA, January 16, 2018 /24-7PressRelease/ — Today one of the leading data recovery companies offering solutions for various data storage devices, ReclaiMe, has published the results of a research aimed at determining which NAS brand is most often encountered in data recovery cases. The research was conducted on NAS devices involving in data recovery using ReclaiMe NAS Recovery software in 2017. The research included 3,476 NAS devices and revealed that ReclaiMe was most often run on QNAP, NETGEAR and Buffalo NAS devices. These three brands accounted for 77% (2,687 units) of the total NAS recovery cases where ReclaiMe was launched. 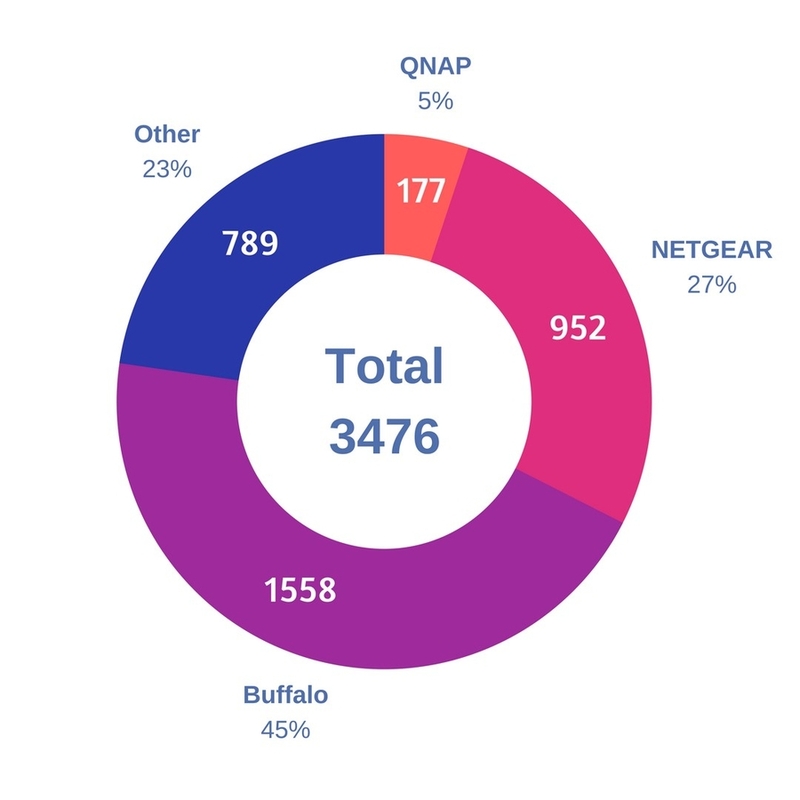 QNAP and NETGEAR together can hardly reach the Buffalo amount. Three main NAS vendors – QNAP, NETGEAR and Buffalo – use different file systems in their devices. QNAP uses EXT, NETGEAR switched to BTRFS a couple of years ago while Buffalo sticks to XFS. Additionally, we analyzed the amount of the recovered data in terabytes. We found that QNAP stores 16 TB of data, on average, NETGEAR – 24 TB, Buffalo – 7 TB. Based on this and assuming that 3 TB disks are used we concluded that a typical NETGEAR unit involved in NAS recovery is a 8-disk device. Buffalo NASes with their 7 TB per device should be two- or three-disk devices. This distribution rather means that Buffalo is more often chosen by home users to organize data storage rather than points that the Buffalo devices are unreliable and, therefore, more likely to break down. Since 2009 ReclaiMe Company has proved itself to be a reliable data recovery solutions provider. In addition to solutions for typical storage devices (single disks, flash drives or memory cards), ReclaiMe develops algorithms for data recovery from complex devices such as NASes, various RAID levels, MS Storage Spaces, HP EVA, VMFS. For more information about ReclaiMe Data Recovery, please visit their official web site www.ReclaiMe.com.